You are here: Home / Printing & Publishing / Rush Press, Inc.
As Continental Graphics Holdings was focusing on its core competencies of specialized technical information to the aviation industry and film services to the entertainment industry, it decided to consider a divestiture of Arts & Crafts Press and Rush Press. The independent sale of Arts & Crafts Press and Russ Press separately as well as a sale of both opertions together were pursued. As the process developed, it became evident that Consolidated Graphics (“CGX”) was both the most qualified and highest priced buyer. In addition, CGX had a desire to hire and provide growth opportunities for the management teams of both companies, providing for a smooth transition. 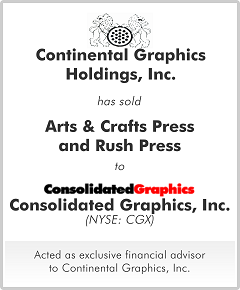 The proceeds from the sale included CGX shares that were sold by Continental Graphics Holdings post-closing to paydown debt and, ultimately, maximize shareholder value.